Some people say I can’t talk about female body weight because I am a guy. However, the most destructive trend happening these days is the “everyone is beautiful” trend. The idea of shutting down criticism by calling it fat shaming is just ridiculous. Plus size women are beautiful; obesity is not. We need to balance these carefully. First of all, calling a woman fat, ugly, a cow, a whale, or any other derogatory statement is disgusting. It is morally reprehensible. A plus size woman should not get cat calls making her want to cry into her pillow at night. I think those who raise awareness about fat shaming are doing a good thing in moderation. It can definitely be taken too far. It is far more productive to encourage someone to be healthy than to deride them for the situation they are currently in. Piers Morgan got nailed for pointing out Kim Kardashian’s cellulite. While it doesn’t help the conversation to criticize Kim’s cellulite, he does raise a great point. We shouldn’t glorify it. What is good or worthy of emulation about heart disease and type 2 diabetes. I don’t know how often plus size women are referred to as “real women.” Are skinny women less woman? Just because a woman doesn’t carry an extra fifty pounds, is she a fake woman? All women are real women (let’s not go into the whole transgender thing here) and we should respect them all as such. So according to Google (that never fallible source), plus-size refers to any “size larger than the normal range.” Okay…. What is normal range? 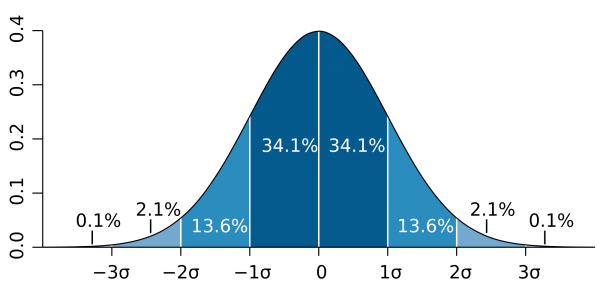 Sizes should be distributed along a bell curve (normal distribution) as shown here. The 0 mark is average. If the average test score is 70%, half of the students got less than 70 and the other half got more. If the average height is 5’6″, half of people should be shorter and the other half taller. Now that we know this, what do we know about larger sizes? Most manufactures define plus-size as ranging from about 14-24. This means that a size 14 should be between the first standard deviation and the average above the average. According to the Revelist, the average American woman is a size 16. An increase of 2.6 inches over the last two decades. At this point, some may be saying that Marilyn Monroe was a size 16. She wasn’t. At about 120 pounds and 5’5″, with a waist of 22 inches, she would not be considered a size 16 by today’s standards. Compare that to the average 34 inch waist of ladies today. If we consider this along side the fact that 60% of Americans are considered obese, we should not be surprised at all. So does average mean okay? Yes and no. Women shouldn’t feel shame for being average. However, considering all the risks that come along with being overweight, everyone (men and women) should fight to loose those extra pounds. Average only tells us how things are, not how they should be. Um, No. When did we become a world where we need to accept everything? I am not talking about tolerance, compassion, or sympathy here. Acceptance is about giving the green light to, the all is good if you will, to a particular thing. We have deemed smoking as unacceptable in this country. We tolerate it, but we don’t accept it. Why is obesity something we have to accept? All that said, you should worry less about what your “dress size” is and worry more about what your doctor and your body tell you. If your doctor says you need to loose 20 pounds, don’t tell him or her that they are fat shaming you. For heaven’s sake, gain some discipline and take the steps needed to be around for your family and friends. It also holds, that if you are engaging in unhealthy behavior to look like a walking skeleton, stop! I say again, if you have an unhealthy body (over or under), you should have an unhealthy body image. And if you are healthy, don’t belittle or put people down because they aren’t. Encourage and ask how you can help them achieve a healthy body. You may also consider adding all the songs every woman needs to hear.